An uploaded video of a graduating high school student voicing out her 'Salutatorian Speech' for their commencement excercise went viral because the School Authorities interrupted her. 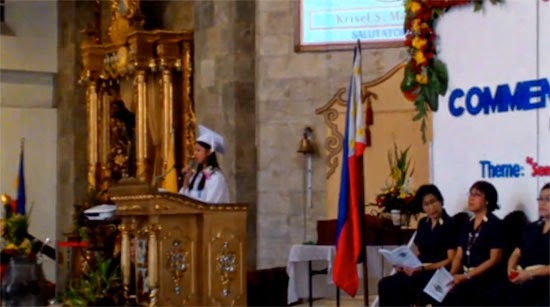 The student was identified as Krisel Mallari who is the batch Salutatorian of Sto. Niño Parochial School in Quezon City. The said speech was interrupted by the School's Admin after Mallari voice out a different speech from what they've approve for. This is some of what Mallari said in her speech before she was interrupted. "Sa bawat taon na lumipas ay puspusan ang pag-aaral na ginawa ko sa eskuwela, naniwala ko sa patas na labanan. Sa pagtatapos ng school year na ito’y isang hakbang na lang ang layo ko sa finish line, ngunit sa pagdating ko rito’y naglaho ang pulang tali na sisimbolo sana sa aking tagumpay, naglaho nga ba o sadyang kinuha?" said by Mallari. Base on what Mallari's statement in her short speech (because she was interrupted! ), she have mentioned some sort of fraud happening in their School. She said, "Maraming tao ang nagbulag-bulagan sa isang sistemang marumi at kaduda-duda. Ngunit di ko ito tinuluran, ipinaglaban ko ang sa tingin ko’y tama, nanindigan ako bilang isang Pilipino na palaban at may takot sa Diyos. Chismis, isang piyesta ng chismis ang inabot ko ng pinagmukha nila akong masama." In an interview made by ABS-CBN, confirmed that she have recite a different speech from what the school have approve. She said in the interview that she knew that the teachers would not approve what she really wanted to say in her speech that is why she did not let it checked. Mallari said, "May freedom of speech naman po di ba?" According to Mallari's sister, before the latter's graduation rites, they've been asking for Krisel's grades computation but the school kept on disregarding their request. Katherine sister of Krisel said, "Limang araw pabalik-balik 'yung dad ko para kunin ang computation." As of now, the viral video has already gained 23,120 views after it was published last March 21, 2015 via youtube.com. For more of Krisel Mallari's full text speech, please do refer to the link posted below of this article. Comments or suggestions about "A Salutatorian Speech interrupted Video went Viral" is important to us, you may share it by using the comment box below.